Very nice setting and new facility. Would be nicer if they had a playground for the young ones and a swimming pool. With that said, staff was real friendly. The grounds were great along with the location. We will return again. Stayed here for a week in August, they were working on new sites and improvements to park making it an even more beautiful place to stay. Very well kept grounds and sites. Restroom and laundry were very nice with patio area attached. Office personnel was the one thing lacking in experience and friendliness, not real sure who was running the park as they seemed more interested in the golf course customers than they were the Resort (Park). Ok folks - this is a golf club - and, apparently, the RV'ers need to fend for themselves. I reported that the bath room was out of tissue and no light bulbs - twice - and nothing was done before everyone went home for the night. Also - after the ""office"" leaves - apparently it is routine to wash dogs and golf shoes in the showers - you are basically wading thru MUD to take a shower!! And this happened on two consecutive nights. The wifi comes and goes - not strong signal - and we were not far from the tower. Kids riding 4-wheelers at nights are kind of noisy too......it's a nice new place.....but a pity that the managers are letting this go on - we will not stay here again. 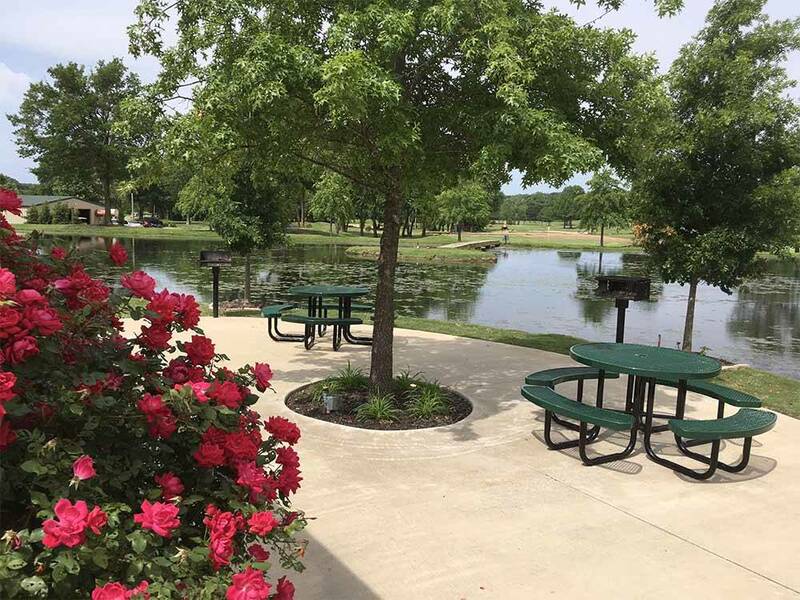 Located on an incredible golf course in beautiful setting, facility is superbly maintained and monthly rate is all inclusive. Walk to the clubhouse for a brew and snack, or pick up a golf cart for a round. 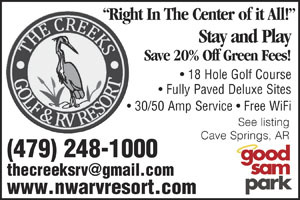 RV guests receive a discount on the course fee's. This is a premium resort with very very friendly people staffing the park as well as the golf course. We were there for 6 weeks and were very sad to have to leave. There is a private fishing lake (catch and release) well stocked with bream and bass, our grand son had a ball catching the bream. Located on two small mountain creeks that offer great views of the water over a gravel bottom. All and in all one of the best RV resorts we have stayed at and we will definitely return.